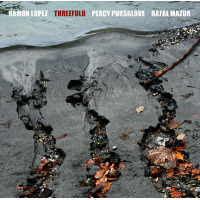 Drummer/percussionist Ramon Lopez follows up his 1999 “Leo Records” release with a quartet outing based upon the Songs of the Spanish Civil War. And if some of you have already formulated notions that this is some sort of historical retrospective, forget it! Here, the drummer has assembled a crew of top-flight European jazz musicians for a set that embodies off-kilter, free-jazz style renderings of traditional compositions rearranged by Lopez. Vocalist Benat Achiary lends his wares to three of these largely abstract pieces, as bassist Paul Rogers, saxophonist Daunik Lazro and bass trombonist Thierry Madiot round out this relatively unique offering. Basically, there are some parallels to bassist Charlie Haden’s famed “Liberation Music Orchestra”; however, the musicians delve much further into the avant-garde here, as they present us with a disparate canvas of disjointed themes and steamy interplay atop Lopez’ wavering, polyrhythmic endeavors. Overall, there is an abundance of fine soloing atop cat and mouse type exchanges and Achiary’s curiously interesting torch song approach to the music, as the vocalist casts a notable twist to this set consisting of boisterous dialogue, stinging opuses and climactic movements. Without a doubt, Songs of the Spanish Civil War is an attractive and cleverly produced actualization of Lopez’ musical visions.